Our bedroom was dirty all edges of the room had not been cleaned for weeks, we reported this the receptionist, we asked her to accompany us to the room to inspect she could not leave the desk. The breakfast was unfortunately somewhat a disappointment, choice of bread was quite limited, tea was "so-so", the choice of cheese and other products was a bit limited and how does one take and eat a freshly boiled egg when no water to cool available. However was able to take an "espresso" after the breakfast which was nice. The furnishings, both in the public spaces as well as in the (standard triple) room I was assigned, were on the shabby side. Spacious room. The bathroom is not separated (but the toilets are), which give a kind a "loft" feeling. Might not be for everyone and surprizing at first, but I liked it. It’s close to the motorway and ideal stopover on a long dustance drive journey. Very quiet place and very accommodating staff, will come back for sure! The hotel has rooms with stylish decorations. 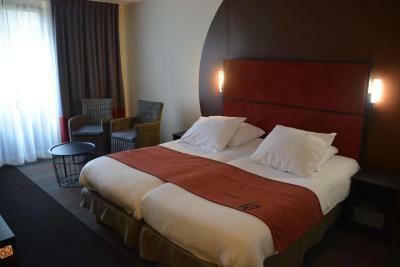 For even greater comfort, enjoy the executive rooms which were refurbished recently. Special rooms are available for disabled guests. The surrounding area gives guests the perfect base for wonderful walking and biking tours. For shopping, the city of Arlon has everything you could wish for. The hotel's restaurant Le Jardin du Luxembourg serves fine and varied dishes. An extensive breakfast buffet is served every morning and known for its local specialties. For a snack or a relaxing drink, the pleasant hotel bar is an excellent choice. There is a sunny terrace outside, which will make you feel relaxed in this green setting. 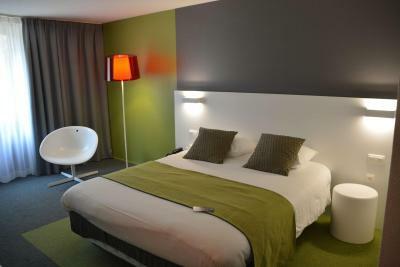 The hotel itself is on the outskirts of the town, just 19 miles from Luxembourg City and only 118 miles from Brussels. This makes the Best Western Hotel Arlux easily accessible. 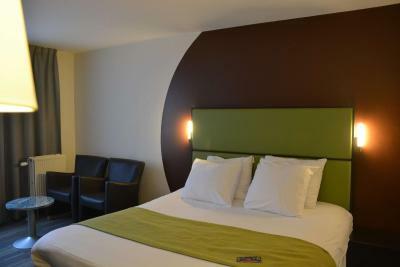 When would you like to stay at Best Western Hotel Arlux? This twin room features a seating area and mini-bar. House Rules Best Western Hotel Arlux takes special requests – add in the next step! Best Western Hotel Arlux accepts these cards and reserves the right to temporarily hold an amount prior to arrival. The batteries of the TV remote control were empty. I wanted to call the reception desk to ask for new batteries but the phone was not working so I had to go to the reception desk to get new batteries. I informed the hotel’s employee at the reception desk that the phone was not working. He told me that there is a problem with the phone. Some guests who were staying in a room not far from mine made a lot of noise in the hallway at half past midnight and it was really disturbing. They were talking and laughing loud for about 15 minutes non stop. The overly bright digital clock on the TV that I could not switch off. It is in a quiet green location. The smell in the area around and in our room. Drains?? Damp smell?? Not enough power outlet, only one of us could charge his tablet at a time sadly. Although we had a family room with one child, there were only two cups and towels for two people. Close to the motorway. Very friendly staff who spoke several languages including Dutch and English. The family room was very large with a choice in cushions. Very clean. There was also excellent koffie and tea facilities in the room. Great breakfast with a lot of choice, including warm snacks. In all my years of traveling, to find a receptionist with such a welcoming smile and attitude was inspiring , Fabriana was undoubtedly the best i have ever met. 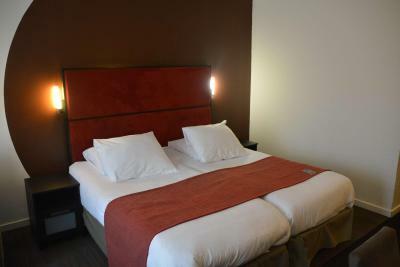 Nothing was too much trouble, thank you for all your help, This hotel is less than 1min from the main motorway, really convenient, rooms spacious and comfortable and the breakfast was superb. They often host meetings and conferences, which make the hotel crowded and not intimate at all. My room was not exactly superclean. I foud dust a bit everywhere and some dead insect. Slightly overpriced compare to competitors. The breakfast is their strenght, very rich and good in quality. Basic service, not a lot to say, staff is professional. 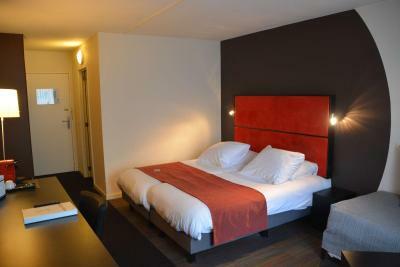 Free parking and close to the highway and Arlon city centre. Location outside town in the woods - quiet.